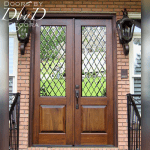 This pair of 30″ X 108″ 8 Lite True Divided Lite (TDL) Doors were designed and built to replace a entry that originally had a door, 2 sidelites and a radius transom. This helped transform this home to a more modern look. The old unit was ripped out and the new unit Stained and Finished and Installed by Doors By Decora. The hardware is Baldwin with a Oil Rubbed Finish.